First Line: The pain always gets worse when the sun goes down. Just hours out of surgery to remove a tumor on his spine, former homicide detective Will Borders is lying on a gurney being wheeled past a crime scene in the basement of the old Cincinnati Memorial Hospital. Borders can see enough to know that the gruesome murder of this doctor is not a random act of violence. In fact, it has all the earmarks of a serial killer case he supposedly solved several years ago. His old partner doesn't want to hear a word about it, and his superior officer tells him that, since he can't walk and no one knows if he ever will, Borders may as well sign his retirement papers. But Borders simply cannot leave it alone, and during his long convalescence wheeling through the corridors of the old hospital, he begins his own investigation. He doesn't stay solo for long because Cheryl Beth Wilson, the nurse who found the murdered doctor, teams up with him. Cheryl Beth had had an affair with the dead woman's husband, and as a result she's right at the top of the "person of interest" list. She knows that the best way to clear her name is to help wheelchair-bound Will Borders. Jon Talton's David Mapstone mystery series set in Phoenix is one of my favorites, and when I heard that his newest book was something different set in Ohio, I knew I would be giving it a try. I certainly wasn't disappointed. Good writing is good writing, and I like seeing an author branch out a bit and try something different. One of the first things to impress me in The Pain Nurse is the inside look Talton gives us of the bureaucratic and political machinations within a hospital, and Cheryl Beth Wilson is the type of nurse we wish we could all have: she's a true advocate for her patients and thinks nothing of standing up to a doctor she believes is causing patients needless pain. Talton also seemed to know that I've always felt hospitals to be creepy places because during the scenes in the oldest, unused parts of the building, I was jumping at every little noise as I read. Killer on the loose? Old dark hospital basement? The faint glow of an EXIT sign far down a corridor? Yikes-- almost too much atmosphere for me! The teaming of two very lonely people-- Will and Cheryl Beth-- add emotional depth to the story. Will has basically been abandoned and forced to stay in the hospital. He has little to do outside of his physical therapy and waiting until it's time to take more pain medication, so it's natural that he would want to conduct his own investigation into the murder. Will's struggle to adjust and to relearn basic skills is one of the strengths of the book. It's also interesting to watch Will and Cheryl Beth become closer as they put clues together in order to bring a killer to justice. 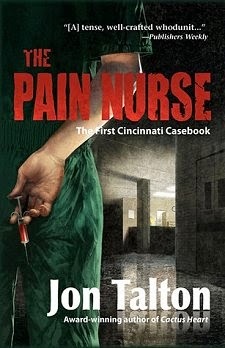 Even though the conclusion seemed a bit over the top, I still enjoyed reading The Pain Nurse, and I'm looking forward to reading another "Cincinnati Casebook." I'm just starting the Mapstone series. I'm on the second one now and have the rest waiting including this new series. I really like his style of writing and truly love it when I get to start reading a series from the start. It's something very special to enjoy-- and follow-- a series from the very beginning. I hope you enjoy the Mapstone books. I'm eagerly awaiting the next one!